Blackberries are great for jam and particularly good in crumble with the season’s apples. 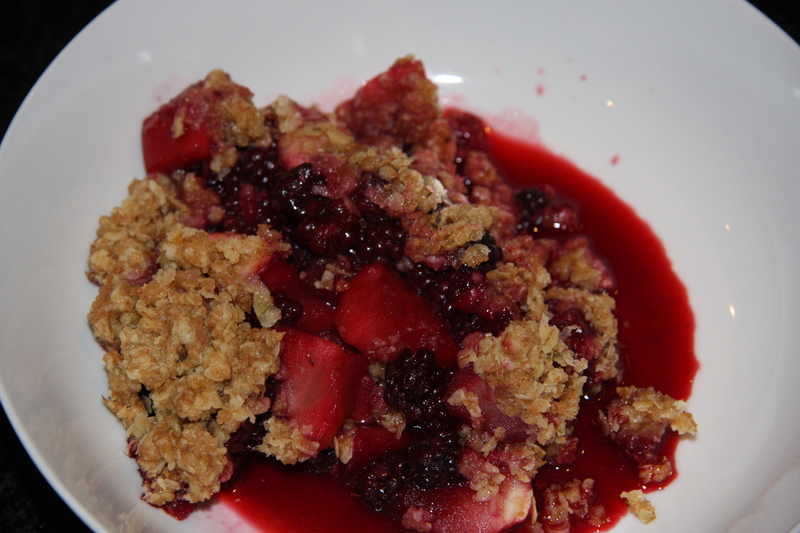 An apple and blackberry crumble is one of the first signs of autumn and it’s delicious. This recipe for the crumble topping is my absolute favourite. It is deliciously light and crunchy and relatively good for you compared with a standard crumble topping. Prepare your fruit however you normally would. I like to part cook the apples in the microwave before adding the blackberries and sugar and add very little extra liquid. How much sugar you add will depend on how sweet you like your crumble – I like it quite tart. Rub the fat in to the flour and add the porridge oats and demerara sugar. Add enough oil to coat the crumbs but not enough to make it clumpy and greasy. Pour over the fruit and make sure it covers the fruit evenly. Do not press it down. Cook for approximately 30 minutes or until golden brown and the fruit is bubbling up. Enjoy hot or warm with custard, ice cream, cream or creme fraiche. Or just on its own. A true taste of autumn. Can we come to supper? Thank heavens for baking, right now it’s the only thing that makes me look forward to fall…oh that and football!